First impressions; sometimes you can stake your life on them and sometimes… Well, this was one of those. The opening song, “Let’s Go Back in Time, Man”, screamed out ‘Rockabilly Revival – again’, and we’ve all seen too many of those built around mediocre pop bands. But the album’s twelve songs long, so let’s not be too hasty. Guess what? By the second song I’d admitted to being a bit premature and by the end of the album, the message had hit home; the title of the first song’s ironic and this is about viewing a mid-twentieth century musical phenomenon through a twenty-first century lens. Forget the revival, this is how Rob’s rockabilly rolls in 2019. 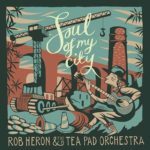 Now, with the best will in the world, some of the original UK rockabilly bands were characterised more by enthusiasm than expertise; that’s definitely not the case with Rob Heron and the Tea Pad Orchestra. These people can play and what they are is much, much more than a skiffle band with better gear. And maybe rockabilly isn’t really a wide enough description for the scope of their work. Just look at all the incongruous elements. The second song, “There’s a Hole Where my Pocket Used to Be” combines a Spaghetti Western ambience and choral refrain with a Theremin and a clever lyric built around the number six. Don’t look for too many predictable where Rob Heron’s concerned. Song number three, “Life is a Drag”, combines lyrics about the joys of cross-dressing with a jazz arrangement, an accordion solo and lead guitar that wouldn’t sound out of place on a Les Paul record. And so it goes on – “Une Bouteille de Beaujolais” evokes a Paris café with an accordion solo, a gypsy Django feel and wine references. You wouldn’t find either of those two songs in a Crazy Cavan set. That’s not the end of the invention by a long way. “Fool Talkin’ Man” has a Gallic Jacques Brel feel with some atonal touches creating a slightly menacing feel while the title song has the feel of a seventies American TV theme married to a lyric about unwanted gentrification in our cities. And even if the album’s closer, “Double Meaning, Double Entendre”, is based on a fairly thin premise, it’s still good fun and there’s always a place for that. Give it a listen; even better, go out and watch them on their upcoming tour. “Soul of My City” is released on Tea Pad Recordings (TPCD006) on Friday February 1st, 2019.